I got the image from Wikipedia. I’m glad we didn’t know that cancer would find us. 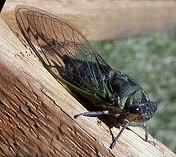 The cicadas are out again, “our” cicadas. I won’t hear them this year. Cicadas do live in Texas, but they don’t swarm in the billions the way East Coast cicadas do, although we do have plenty of cicada killers flying around. I miss a lot of things about living back East, including the sound of cicadas. I wonder where I’ll be in another 17 years. I hope I’ll find out. Let me take you to the Zen Center one evening this coming July where we have a nature trail with lots of trees and wildlife. One July? I saw an amazing stand of ‘Queen Ann’s Lace’ with numberless firefiles hovering and twinkling over these white plate-shaped flowers. Another night I sat outside the Zendo and heard waves of cicada love-songs waxing and waning in volume during each brief moment. If it’s a 17-year locust, this year ought to be dramatique !! !